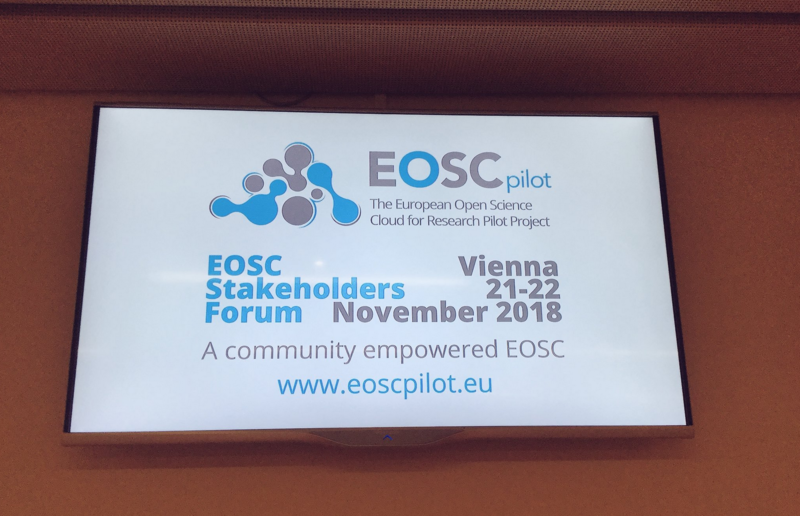 Plenary Session of the EOSC Stakeholders Forum was opened by the EOSCpilot Coordinator Juan Bicarregui where he highlighted the current state of the EOSC where it can already perform its key functions but is still in need of further development to bring it to its full form. He also emphasised the newfound importance and role of the EOSC Stakeholders Forum where it will now become an official part of the EOSC Governance Structure. Following the welcome speech, the various H2020 implementation projects - EOSC-hub, eInfraCentral, FREYA, and RDA - Research Data Alliance Europe 4 working towards the realisation of EOSC, presented their projects and their efforts towards implementing an EOSC in Practice for the future months. Delivering the keynote for the inaugural session was European Commission - Research and Innovation (DG RTD) head of unit Jean Claude Burgelman, who expressed his immense gratitude to the EOSCpilot project for the work that was executed so far. “EOSCpilot has defined the scope of the EOSC and has gotten off the ground what originally did not exist before. Now, it is launched and this is because of projects like yours,” said Jean Claude. Jean Claude also added that while there was a strong policy push with key players being present, as evidenced in the past two EOSC Summits, the majority of the work has been done in conjunction with stakeholders to begin a truly user oriented EOSC going forward. He also touched upon the two consultations by the EOSC High Level Expert Group and the FAIR Data Expert Group. Their results have been summarised in two reports, Prompting an EOSC in Practice and Turning FAIR Data into Reality. Jean-Claude also discussed developments in FAIR data, the EOSC Governance and financing. DG RTD - Open Science and Open Innovation Director Jean-David Malo also sent a message to the forum read on his behalf by Burgelman emphasising the importance of research infrastructures to the EOSC. “Research infrastructures (RI) should be more open towards finding synergies with EOSC. RIs shouldn’t be afraid to lose their role. In fact EOSC will facilitate their involvement even further,” he said. During the event, EOSCpilot science demonstrators presented their experiences and findings. As real world projects experimenting on ways to implement EOSC in different research fields, three sessions have been dedicated to allow these science demonstrators to present their project, its successes, issues faced and lessons learned spanning technical and procedural implementation. These can be accessed through the slides in the session pages: Life and Materials Sciences Session, Social and Earth Sciences Session, and Physics and Astrophysics Session. It was emphasised that more than the governance ‘body’ itself, what should be the focus is on the internal processes and workflows as well as identifying who the actual stakeholders are and their role and representation in governing the EOSC. Potential Working Groups to be established were discussed along with business models and rewarding schemes, and how to come up with a minimum-viable ecosystem for the EOSC. Overall, stakeholder engagement is foreseen to play an important role in the next few years and this will further support the user-centred approach from a governance perspective. in some domains, but these have to be expanded to the cross-disciplinary and international level. While progress has been made towards further interoperability through EOSCpilot’s work, the panel session revealed continued challenges in multidisciplinary data reuse, the difficulty of getting communities together, and how ‘generic solutions’ aren’t always fit for use for some disciplines. In the end, it was highlighted that the work now needs to go towards providing practical guidelines. As a vital principle to ensure the participation of providers, openness along with inclusiveness and transparency is one of EOSCpilot’s final recommendations for the EOSC Rules of Participation. Allowing researchers better access to services and sharing opportunities were mentioned as the goals for EOSC. EOSC should be able to facilitate larger collaboration among researchers and all the players. Collaboration is not always easy but clear rules of participation will help to work together, said University of Strasbourg Researcher Francoise Genova. Meanwhile, the HPC community expressed their concern on how the rules may affect access to services and to the whole ecosystem. During the panel, the recommendations on (1) developing the Charter for Access to EOSC Infrastructures Services and Other Resources, (2) providing a comprehensive and coherent IPR framework, and (3) promoting an EOSC Skills and Capability Framework received the most approval from the panelists. culture. We need to move towards practical commitments,” she said. Françoise Genova’s keynote pointed out that data science and data stewardship skills are essential and further steps need to be taken to develop professions in these areas. Efforts in FAIR data and data stewardship need to be recognised and rewarded. Aside from that, the curricula for training needs to be improved and funders should provide mandates that set top-down incentives to further create interest in acquiring these relevant skills. As part of the effort to involve industry, the Industry Session was held and highlighted that open science can create fruitful new relationships between academia and industry. Future demand and standardization of services included in EOSC will incentivize the industry. However, there is a risk of overregulation of EOSC. Since business is very agile, EOSC should not try to think too far ahead, and instead leave things open and discuss with industry. An EOSC “Charging Strategy” was also covered. A voucher system or cloud credit/coin model for more flexible requirements should both be implemented in different kinds of data, services or users. Moreover, the value of the data should also be taken into consideration, and here a series of future initiatives will cover this in greater detail. Overall, the attendees agree that a lot of the preliminary work that has been built through the past two years of the EOSCPilot project has resulted in a clearer idea of what the EOSC will look like. It is also evident that since the start of the project in January 2017 a series of parallel EOSC initiatives have taken place and have engaged with the project. The much needed stakeholder-sourced recommendations on how to implement the EOSC from various contexts - governance, rules of participation, skills etc. have been presented. Now is the time for implementation, the development of more practical and actionable guidelines, and the promotion of policies, all while ensuring that stakeholders remain at the centre throughout the development of the EOSC.